In the last few weeks there have been some important changes made to Xcel Energy’s Solar*Rewards, PV Demand Credit, and Standby Service Rider programs. These changes will affect current Xcel customers as well as present new opportunities for those who haven’t yet made the switch to solar. 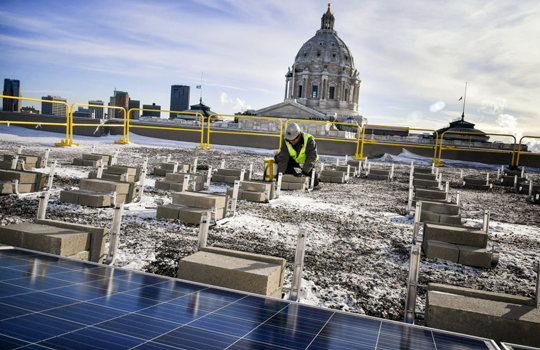 During this session the Minnesota legislature passed HF 3232, which increases the Solar*Rewards capacity size limit for projects from 20kW to 40kW. This means that bigger solar projects can now qualify for the popular incentive program. Under the previous limit many customers were forced to leave usable roof space empty, an issue that this increase should help mitigate. Solar*Rewards is a performance-based incentive program offered to customers to help offset the cost of installing solar. The incentive of $.08 per kWh is paid annually for 10 years. The program capacity increased dramatically for 2018, from 4.6 MW last year to 13.7 MW. For more info on Solar*Rewards head to Xcel Energy’s website. Xcel Energy recently worked with the solar industry, regulators, customer advocates and other stakeholders to create a new, more easily understood PV Demand Credit. The new credit, on average, is meant to be financially similar to the prior credit structure but uses a more easily understood per kWh credit during times when Xcel customers demand the most energy. These new credits will replace the current PV Capacity Credit. The new PV Demand Credit Rider will become effective June 1 for any customer with solar systems over 40kW with a single production meter. The new rider will have the same monthly customer charge; however the bill credit will now be 7.139 cents per kWh for solar energy generated between 1 p.m. and 7 p.m.
Xcel also created a new, simpler, Standby Service Rider that will take effect on July 19th. The revised Standby Service Rider is available to customers with on-site generation greater than 100kW who have chosen to have Xcel Energy cover their load when their generation is partially or wholly unavailable. The revised rate is based on the amount of resources Xcel needs to have available to support a customer if their generation becomes unavailable. The revised rate, on average, is meant to be financially similar to previous Standby Service charges but more easily understood. The revised Rider retains reservation demand charges (think of these as the reservation fees to have resources available should you need them), but replaces the current monthly demand charge for standby capacity used with a peak-period kWh based surcharge. The benefit of the former grace period was included in calculations for the new rates and therefore is no longer a stand-alone feature. Xcel also added options for more frequent monthly nominations of the capacity amount. This entry was posted in Solar Industry on August 4, 2018 by Kyle Wehnes.